After writing about bamboo recently, I am amazed at the number of requests I received for information regarding how to control it. It appears ‘containment’ is a big deal to many of you across the country. The most common question I get relates to when a neighbor’s bamboo has gotten out of control and is now invading their property. They want to rid themselves of the offending plant. But here is something to keep in mind if you want to keep your neighbor. Unless it has been previously separated in some way, a grove of bamboo is actually one plant. I mention this because if you begin a stringent eradication process you may end up starving and eventually killing all the bamboo. That includes what you might want to keep as well as your neighbor’s. However, if you’re at your wits end and ready to do battle, here are some suggestions you can implement to begin the process of bamboo eradication. 1. Isolate the part you want to kill from the part you want to keep. Do this by severing the rhizomes (spreading roots) with a spade, mattock, ditch digging machine or by whatever means you are able. 2. Cut the grove all the way to the ground. 3. Water and fertilize the area to encourage new growth (yes, really). Since I know you are wondering why I would say such a thing, the process of cutting and promoting new growth repeatedly stresses, weakens and eventually depletes the plant of the energy to persist. 4. Cut it down again (or apply an herbicide) Repeat this process until the rhizome is eventually starved out and no longer puts up shoots. Keep in mind this is a process, not a quick fix. This is much easier than attempting to till or dig up and remove every rhizome in the ground. But if you’re up for it, that is an option too. Then send me your contact information. I’d like to shake your hand! If you’d like to grow bamboo, a little advance planning will make sure it is much easier to contain. 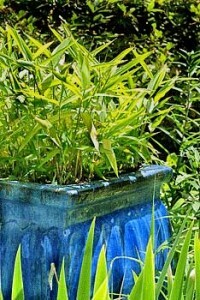 Speaking of which, growing bamboo in a container is a great way of keeping it in bounds. There are a number of suitable varieties, such as Dwarf Greenstripe (Pleioblastus viridistriatus). With a mature height of two to four feet and perennial even in Minnesota, this is a great choice around the country. Another strategy includes choosing varieties of non-invasive clumping bamboo. Unlike their aggressive cousin, the clumping varieties are rather content to stay put. Although they will spread, they do so much more slowly. There are many nurseries and online sources that offer clumping varieties. If you decide on a running bamboo, a barrier will be necessary to keep under control. Barriers can be made of concrete, metal or plastic. A high density polypropylene, 40 mils thick or more, is readily available for just this purpose. It must be placed at least 2-3 feet deep in the soil and angled out away from the grove. Bamboo rhizomes will jump an improperly installed barrier. However, properly installed, it will at least deflect the rhizomes so they are visible above ground and can be removed before they have the chance to spread outward. It is important that the barrier extend several inches above the soil line for this purpose. A ditch or stream is also a useful containment option. However it is necessary to monitor the grove once a year, trimming off any renegade rhizomes. In some cases simply mowing the new shoots regularly or even kicking them over will suffice. This is much easier with the smaller caned bamboos. If you are in doubt as to whether you really want to experiment with running bamboo in your landscape, keep it in a pot for a while. Just make sure to monitor that drainage hole! Those rhizomes are great escape artists. 6/29/15 Update: Comments are currently turned off for this post. Thanks! My husband and I recently purchased a home where a previous owner had planted 4-5 shoots in the corner of our property about 20 years ago, well the bamboo of course spread like wildfire, it became extremely dense, 30 foot shoots in about a 100 square foot area. We decided to chop down all of the shoots with a chainsaw last weekend (now we have 2 massive piles we need to dispose of, we may hire someone to chip it for us), this weekend we rented a kubota (tractor) from Home Depot for about $300 with a back hoe. It took us all day yesterday but we were able to dig up about 85% of the root balls and rhizomes using the back hoe. It was a lot of work but we saved a lot of money doing it ourselves. Couple of questions, our yard backs up to woods, we dumped the roots back there do you think the roots will begin to grow again? We had a frost last night and winter is coming soon so I was hoping the frost/cold would kill them (they’re not dumped on exposed soil). Also, considering we removed most of the connecting root system do you think the remaining bamboo will die off? I am paying $30,000 to install bamboo control & eradicate a 50×400 foot section. Would love to know how to get it done over 3 acres for $2,000.00! I am spending already close to $1000.00 on help digging up the rhizomes an roots!!!! It has ruined my beautiful land. I am so frustrated. I have a herbicide that really kills it, it’s not roundup that doesn’t really work. I’m paying to have a barrier on 3 acres, very expensive for me. It will be close to $2000 by the time I’m done. So Dianne, what is the herbicide that kills your bamboo? I need some. Thanks. I got a sprayer from Home Depot and mixed 2x recommended amount of Round-Up poison ivy killer with 2x recommended amount of Bayer heavy brush killer (that’s a 4x solution because you don’t double the water). I cut each plant to near ground level, drilled straight down with a 16″ drill bit, and sprayed the opening until it was filled up. My neighbors’ bamboo is still growing but mine is now under control–mind you, I am NOT saying I killed it all, just that there is very little new growth in the past 5 or 6 weeks. I started this in April in what I guess is peak growing season and it seemed to deplete the energy stores, so I’ll see what happens next spring. My neighbors bamboo has made its way all over my yard in quick fashion. Ends up in some odd areas. Including areas behind a privacy fence inside my yard. I’ve killed it all before and has returned for round 2. Due to tree roots and shade all the time, grass doesn’t grow well at all. I want it all gone and don’t really care if it carries over into neighbors yard. Suggestions? You could try breaking off the shoots and spraying an herbicide like concentrated glyphosate (aka Roundup) onto the newly exposed shoot. I’ve personally never done this, but from those I know and trust who have, it works eventually, although you may need to re-treat. I have at least 3 seperate David Bisset plants in my front yard. Aprox 3 years old. One is growing towards a creek. I want to get rid of it all and digging seems impossible. If I sever the roots that are growing away from the center, and leave the new severed roots to the new shoots underground, will the left behind roots continue to grow new roots and shoots? Also, should I wait until the new shoots that are growing away from the center grow before chopping down or just kick over new shoots? Or will severing the root take care of it? I understand it can taken years, but I want to keep this growing at a minimum and hopefully kill it all without digging. will severing the roots away from the center contain growth to the center only? my beautiful clump of zig zag golden vein bamboo has turned into a monster.. not even talking about the black birds in the winter spring and fall.. ive cut it down and hauled it off at 100 per day for the workers and it doesnt even show that any are gone.. now you tell me about the ditch method.. it ran into a ditch and its growing just fine there. but soon my home is going to be taken over..im going to try the brush b gone stuff come spring… love your site..
Dolores, you can swab the ends of the cut bamboo with glyphosate (commonly sold as Roundup but there are many generic versions out now that are a lot cheaper!). You can also you Triclopyr, which you’ll find sold as “Brush-b-gone”. Experiment at first to find out what impact this might have on the parent plant. I know people that have had good results with this method but I’ve never done this personally so I cannot tell you from first hand experience.